Indigofera tinctoria Linn. (Family: Fabaceae) is traditionally used for the treatment of various ailments including nervous disorders. In homoeopathy too, I. tinctoria is used in the treatment of epilepsy and other nervous disorders, but no data has been scientifically documented to establish its central nervous system activities. In the present preliminary study, the different potencies (3x, 6x, 12x and 30c) of I. tinctoria administered at a dose of 0.5 ml/rat/day were evaluated for their analgesic (hot plate, ice plate and Randall -Selitto tests) and behavioural (rota rod and open field tests) activities. The results revealed that all the four potencies of I. tinctoria had increased the latency time required to raise and to lick the fore or hind paw for thermal sensation on hot plate test and for cold sensation on ice plate test. They had also increased the quantum of threshold pressure to mechanical induced pain on Randall -Selitto test but depressed the motor coordination and locomotor activities. The observed activities suggest that the homoeopathic formulations of I. tinctoria possess CNS depressant property. However, further studies are required for a definitive conclusion. Background & objective: Uterine fibroids (UF) or leiomyomas are found in 25% to 35% women of reproductive age. It is one of the most common indications for hysterectomy further leading to complications. The present observational study on UF was undertaken to arrive at a group of useful homoeopathic medicines for the treatment of the same. Methods: A prospective observational study was conducted at Princess Durru Shehvar Children's and General Hospital, Hyderabad in coordination with its Extension Unit of Drug Standardization Unit (Hyderabad) of Central Council for Research in Homoeopathy during September 2006 - August 2009. One hundred and thirty eight patients with UF were screened as per the pre-set criteria and 103 patients were enrolled. Homoeopathic Medicines were prescribed to the enrolled patients on the basis of repertorization of the symptom totality. The improvement of the patients was assessed subjectively through the clinical symptoms and objectively through USG pelvis. Results: Out of 103 patients enrolled, follow up of 71 patients was completed as per protocol and their data was analyzed. In 12 patients, fibroids resolved completely. There was statistically significant reduction in some of the symptoms/signs as well as in size of fibroid(s) (p= <0.05). Calcarea carbonica (n=16), Pulsatilla (n=14), Phosphorus (n=7), Lycopodium (n=5), Sulphur (n=3) and Kali carbonica (n=2) were found to be most useful among the prescribed homoeopathic medicines. Limitations: This was an observational study with no control arm, with the duration of follow up being only 8 months. 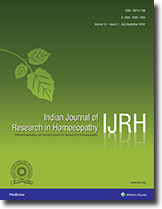 Conclusion: This study has shown positive results in terms of reduction and resolution of UFs with homoeopathic treatment. Further RCTs with long follow ups need be conducted for definite conclusions. Introduction:Clinical verification is an ongoing research programme of the Central Council for Research in Homoeopathy, under which many Indian and rarely used drugs in Homoeopathy have been Clinically Verified. Staphylococcinum is a nosode, prepared from the bacterial endotoxins of staphylococcus pyogenes aureus. In India, the medicine is prepared as per the direction of preparation of nosodes of N-I group of Homoeopathic Pharmacopoeia of India (HPI). The Council had under taken an observational study on Staphylococcinum from 2005-2010, to determine its therapeutic effects through Clinical Verification. Objectives:The study had two objectives. The primary objective was to clinically verify the symptomatology of Staphylococcinum as observed during its proving conducted by Council on this drug and the secondary objective was to ascertain the additional clinical symptoms, if any. Materials and Methods:In this multi-center study, a total of 411 patients from all age groups & both sexes were enrolled from the OPDs of the institutes and units of the Council adhering to the inclusion, exclusion criteria as per protocol. The informed written consent was obtained from each patient before the enrolment in the studies. The presenting signs and symptoms were recorded in a predefined case recording proforma. On repertorising the symptoms of each patient, if Staphylococcinum was found to be the simillimum or very closely similar to the symptoms of the patient, the patient was included in the study. The medicine was prescribed in different potencies, viz. 30C, 200C and 1M in ascending order, as per the need of the case, in accordance with homoeopathic principles. The progress was noted in a follow up sheet to determine the effects of the medicine. Result:It was observed that many of the symptoms of Staphylococcinum obtained during the proving of this drug, (conducted by the Council) were present in the patients, which were relieved after administration of Staphylococcinum in this study. Thus the study verifies the symptoms of Staphylococcinum obtained earlier during proving of this medicine. The study, in addition, reveals few additional clinical symptoms not obtained in the proving. Conclusion:Staphylococcinum can be considered as an important medicine for acidity, acne, aphthae, arthritis, dermatitis, fever, headache, toothache and urinary tract infection. In the study, 24 symptoms of Staphylococcinum were clinically verified and 13 clinical symptoms were evolved. All the verified symptoms confirm the scope of its therapeutic action. Background:The risk for lower extremity amputation (LEA) in patients with diabetic foot ulcer is high, and high recurrence rates of foot ulcers pose a risk that the amputations will be repeated. While the incidence rates of diabetic foot ulcers are often poorly documented, such as is the case in India, the heavy strain of the disease on health care budgets can easily be felt the world over. The high cost of the treatment of foot ulcers causes many patients to neglect needed care, resulting in amputations. The present observational study of diabetic foot ulcer was undertaken for the purpose of deriving a group of useful homeopathic medicines for the treatment of this condition, hopefully revealing a cost effective means of reducing the incidence of foot amputations. Method: A prospective observational study was conducted by the Central Council for Research in Homoeopathy at its Drug Standardization Extension Unit, Hyderabad, from October 2005 to September 2009. One hundred and fifty-six (156) patients with diabetic foot ulcer in the age group of above thirty years from both sexes were screened and eighty-one patients were enrolled as per the pre-set inclusion and exclusion criteria. Out of eighty-one cases enrolled only sixty-three cases completed the follow up. The remainder of the cases were excluded. Homeopathic medicines prescribed to the enrolled patients were limited to a group of fifteen pre-defined trial medicines. The improvement of the cases was assessed basing upon the diabetic foot ulcer assessment score, before and after treatment, on a prescribed format devised by the council (Table 1) and by periodic photographs. Results:The difference in the mean of the ulcer assessment score was found to be statistically significant (P=0.000, <0.05) after the treatment with trial medicines. In only one case, the ulcer assessment score showed no significant improvement from the baseline. Silicea (n=22), Sulphur (n=11), Lycopodium (n=10), Arsenic album (n=8), Phosphorus (n=8) were found to be the most useful among the fifteen pre-identified trial medicines. Conclusion:This was an observational study with positive results; however, it is difficult to attribute the positive results to homeopathic therapy alone as the dressing of the ulcer and ancillary measures of themselves often eventuate in ulcer resolution. Further RCT corroboration is recommended for validation of the results. Background: in a previous paper we reported the statistical analysis and other distribution data of a homeopathic pathogenetic trial (HPT) of Plumbum metallicum 30cH carried out by our group. However, at that time we did not report the resulting pure materia medica, i.e., the totality of symptoms elicited by the tested medicine on healthy volunteers. Aim: to communicate to the homeopathic community the full record of symptoms collected in our HPT of Plb. Methods: methods to collect and select symptoms have been reported in the previous paper. In synthesis were excluded all previous common symptoms of volunteers, even with slight differences, and selected only those that were really unknown, never seen, unusual or very strange for the prover. In this paper special emphasis was given to new symptoms as well as unusual or repeated dreams, while in the previous paper special emphasis was given to repeated and crossed symptoms. Results: symptoms are reported in their chronological order of appearance in each volunteer. 37 new symptoms were found, useful to update Homeopathic Repertories. It is also included a synthesis of the original HPT of Plb carried out in 1828 in order to make available the full experimental materia medica currently existing. Conclusions: the new HPT, besides widening the pathogenetic picture of Plb (skin and mucosae symptoms), also allowed us to give new and deeper meanings to some of the symptoms reported in the original trial, such as Anxiety, Activity, Depression, Slowness, Gastro-oesophageal problems, Colitis. The dreams complete the remedy image, mainly in work, religion and sexual themes. Up to the present time there is no peerreviewed publication devoted to HPTs. For this reason, researchers are compelled to publish HPTs as private editions. This results in poor control of the quality of publications and a lack of standards on how to present the results of HPTs. Recent studies on viral genetics establish swine-H1N1 - responsible for the ongoing pandemics - as a remainder or continuation of the agent causing the flu epidemics of 1918. This study aimed at analyzing whether this common etiology also result in significant correlations of clinical manifestations. To do so, data were collected to compare the clinical evolution of cases in the 1918 and 2009 epidemics. This historical revision was the ground for evaluating the response to treatment including homeopathy in the former epidemics. It is discussed the convenience of including homeopathic prophylaxis grounded on the diagnosis of the epidemic genius among public health actions. A 6 year old boy, presented at Mother and Child Health clinic of Regional Research Institute (Homoeopathy), Mumbai, suffering from very rare neurological syndrome sub-acute measles encephalitis (SME) with early neurological sequel, treated with Zincum metallicum on the basis of totality of symptoms. The auxiliary measures, nursing & medical care was provided along with homoeopathic treatment. The effective response was observed without any post viral neurological deficits. The total duration of follow up of the case was two years and six months.